Primary students are active explorers, and are naturally curious about their world. They learn best through direct discovery in hands-on experiences that engage the five senses. During the primary years, students develop the ability to approach the world logically, with an increasing capacity to use abstract reasoning. • What is a forest? • Who lives in forests? • What can we do to help forests? Giving students opportunities to be keen observers will provide them with a strong foundation for becoming both good scientists and critical thinkers. Simple investigations both inside and outside the classroom will help them learn to analyze results and apply their understanding to new situations. Collecting and categorizing natural objects, and other hands-on activities, will help acquaint them with the natural world in general – and with Oregon’s forests in particular. If you are looking for ways to increase your students’ literacy, OFRI offers free materials that reinforce reading skills and teach important Oregon science and social science topics. 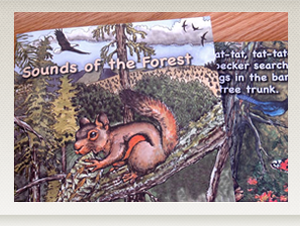 Sounds of the Forest is a publication for young readers that features text and color illustrations. It tells the story of some of the animals that live in Oregon's forests. Forest Essays is a collection of readings that supports literacy skills and teaches important Oregon science and social science topics. The readings, which include multiple-choice and short-answer questions to gauge comprehension, can be used as an assessment tool or as a teaching resource, for individuals or groups.